things to do in Galveston: Air Boat Tours. There are many things to do in Galveston like the Air Boat Ride adventure. A thrilling Galveston tourism experience to discover. There are attractions for all age groups. Some spend their time at the beach, the water park and other interesting sites. For those who want to go the extra mile to experience some adventure, there are things for them to do. A Segway tour of the city can be adventurous while an air boat adventure ride can be exciting and stunning. Capt. Hal Newsom's Air Boat Tours called the "Gator Getter." depart from the Waterman Restaurant and Marina to explore the Galveston Bay. It's an interesting experience. Discover the vast stretch of undisturbed marshland. Watch birds, turtles, marsh and sea life and sometimes alligators. Go on the air boat fishing tours through the local bay, lakes and rivers, including flounder gigging and nighttime bow-fishing tours. Enjoy fishing at the desired spot with all fishing equipment supplied by the Air Boat Tours. Capt. Hal Newsom's Air Boat Tours is opened all year round if the weather permits. This ride is not recommended for children under 5 years, pregnant women and people with back or neck problems. 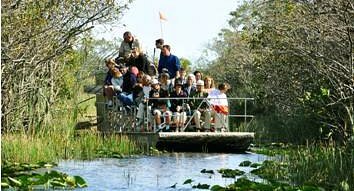 Air Boat tourists are advised to wear comfortable shoes and a light jacket on the tour. Bring your own food, drinks, sun screen and insect repellent. The tour boat does not provide this package. This is one of the best adventurous things to do in Galveston. Enjoy the outdoor adventure with Air Boat Tours. Capt. Hal Newsom is U.S Coast Guard Licensed (License #1071903) and fully insured. The tour pricing depends upon the number of people and the length of the tour. However this is the regular price. Reservations can be booked in Cash, Master Card, American Express, Visa and Discover Card. Personal checks are not acceptable.